Besides the planets which perform their revolutions in orbits nearly circular and which almost always remain within our view or at least within the reach of our telescopes there is another species of bodies which only present themselves to our view at short and distant intervals, which shine with splendour for a time and then retire into the depths of the heavens. These have been usually called comets and are distinguished from either stars by a long train of light which usually accompanies them and which is always situated in a direction opposite to the Sun and which diminishes in lustre as it recedes from the body of the comet. Of all parts of philosophy that which was the latest to receive solid improvement was undoubtedly the theory of comets. The stars were considered as meteors little different from the exhalations and luminous appearances which we sometimes behold in the atmosphere. Some philosophers as Apollonius, Seneca and many of the Pythagoreans had more correct notions on this subject but these seeds of truth were extinguished by a weight of prejudice and by the authority of the Aristotelian school. From this opinion it unfortunately happened that the ancients were very careless in making and transmitting to us observations on these phenomena and we have now only to regret they were so little enlightened on this subject since from the want of materials with which they might have supplied us the decision of some of the most interesting questions of physical astronomy will probably be postponed some centuries. Until the time of Tycho Brahe we find concerning comets but few reasonable conjectures. This celebrated observer began to open the eyes of astronomers to the real nature of these bodies by an important discovery. He demonstrated from the smallness of the parallax of these bodies that they are much more distant from our Earth than the Moon is. He even endeavoured to represent their course by supposing them to move in an orbit round the Sun. This however we should observe was an hypothesis purely astronomical and he by no means supposed that they were planets of a peculiar nature revolving round the Sun. This discovery of Tycho [Brahe] was confirmed by the observations of various astronomers of his time. And at the commencement of the 17th century it received new illustrations from Galileo and Kepler. It was natural as soon as Men were undeceived respecting the situations of these bodies for Men to endeavour to submit their motions to calculations. Tycho [Brahe] had set the example and Kepler soon followed it; this celebrated astronomer imagined he could represent their motions by supposing that they moved in a straight line. He was obliged however to acknowledge that they did not move uniformly in this line. This circumstance ought naturally to have led him to consider their path as curved. But being unwilling to give up the straight line he was obliged to admit an acceleration and retardment in different parts of it. It is singular that Kepler who was in other matters so clear sighted, who possessed a genius peculiarly calculated to penetrate into those causes which contribute to the order, the harmony and the magnificence of the universe, should have been little better acquainted with the nature of these stars than the herd of mankind. He confined himself to supposing that they were new productions of Nature similar to the meteors which sometimes appear in our atmosphere. The supposition that comets move in a straight line was for a long time the favourite hypothesis among astronomers. The positions of the comet which appeared in 1665 were calculated by this method and it had caused some surprise that the results were not far distant from the truth. We shall however presently see the reasons of this coincidence. It was however from Cassini that this hypothesis derived its greatest celebrity. He applied it to the comet which appeared in 1652 and also to several others and his results were sufficiently near the truth to convince many that he had arrived at the true explanation. It must however be observed that his hypothesis would not satisfy distant observations on the same comet and that to a great number of them it was utterly inapplicable. It will naturally be enquired how it could happen that from a false hypothesis so many observations should be satisfied as to produce for it a considerable reputation for several years. The answer to this question is not difficult. Comets according to more modern observations are found to move in flattened ellipses. In some cases these ovals are so much elongated that they approach very nearly in some parts to the nature of a parabola. A parabola is a curve composed of two branches which at a short distance from the summit approach very much to straight lines. From this circumstance a comet if seen in one part of its orbit will seem to be moving in a straight line. A comet when it is approaching the Sun gradually disappears in its rays and after being hid during some time is seen moving from the Sun. This can not be reconciled with the hypothesis of Cassini and in fact he made a singular mistake respecting the comet of 1680-81. All those who supposed the comet to move in a straight line imagined that there were two different comets which moved in straight lines passing very near the body of the Sun, whereas in fact it was one and the same comet which only disappeared from being lost in the Sun's rays and again became visible in its recess from that body. It is remarkable that the ellipse which this comet really described is very much elongated so that its two sides approach nearly to straight lines. And it was principally from the accuracy of his predictions relating to this comet that Cassini astonished the world and extended the credit of this theory. But the triumph of this hypothesis was only caused by a fortunate coincidence of circumstances. It was therefore transient and soon gave place to another incomparably more accurate. In fact notwithstanding the theory of Cassini it was soon discovered that the paths of comets are not straight lines, but that they are curved and that the concave part is directed towards the Sun. Helvetius recognised this fact and Dr. Hooke demonstrated it. He says that we must positively reject the testimony of observation. It is in contradiction to this. Helvetius imagined comets to be eruptions projected from the body of the Sun or even from the planets. "If" said he, "we project a body from the surface of the Earth it will describe a parabola. Therefore" said he, "these bodies which are projected from the Sun or planets will also describe parabolas." As to the physical construction of these bodies he imagined them to be nothing more than a collection of vapours collected in the atmospheres of the planets which gradually rose higher and higher till at last they were projected from them and moved in different curves according to the velocities they had acquired. Such was the state of the theory of comets when the celebrated one of 1680 made its appearance. It was first accurately observed in Saxony on the 4th November. It was then moving with increasing velocity towards the Sun. About the 30th it moved at the rate of 5 degrees in a day and shortly after it disappeared. About 22nd December it reappeared moving very swiftly from the Sun and its velocity gradually diminished until the middle of March 1681 when it was no longer visible. On its return from the Sun it had a tail or train of light extending 70 degrees, that is it reached much more than one third of the heavens. It was proved that these two [appearances] were the same comet from the resemblance of the solid nucleus which presented the same appearance before and after its passage near the Sun, and also from the direction of its course which was the same. But the strongest proof was that the calculations which Newton made respecting this comet and which were founded on this supposition agreed accurately with observation. It was a fortunate circumstance for the progress of Astronomy that the Earth was in a favourable situation to see both the access of this comet to the Sun and also its recess from that body. Without this accidental circumstance the true system of the cometary motions might not perhaps have appeared for a long time. But this singular coincidence hastened its discovery. The first outline of the true cometary theory came from Germany. A clergyman named Doerfell, the minister of a small village, had observed the comet with much care. He is an astronomer very little known and has not received that credit which was due to [him for] the manner in which he treated a subject which was at that time both new and difficult. Doerfell proved that the comet which receded from the Sun was the same as the one which had approached it a short time before. He showed that it moved in a parabola having the Sun in its focus. He ascertained the distance at which it passed from the Sun. All these circumstances were published in 1681, but the language in which it was written and probably the little reputation of the author caused it to be neglected, and it was not noticed until long after Newton had established the same truths by other methods. The anticipation of one of the discoveries of our great countryman does not however in the least denigrate from his glory. It was with Doerfell an astronomical hypothesis, but with Newton it was a physical truth, a branch of his general system. In fact it was impossible for our astronomer after having established the gravitation of the planets towards the Sun and recognising as he did with the astronomers of his time that comets are not the transient meteor of a moment, not to suppose them governed by the same laws which regulate the other bodies of the System. It was therefore necessary to suppose revolving in very eccentric ellipses to account for their not being constantly visible. But Newton still further demonstrated the truth of his method by applying them to the determination of the path of the comet of 1680 and it is remarkable by what accuracy his calculations of the position of the comet agreed with the observations of Flamsteed. The greatest difference only amounted to two minutes of a degree. The comet of 1680 was remarkable for the long period of its revolution, which is 575 years, and also for its near approach to the Sun. According to Newton it approached so near as to be distant from that body only the ?th part of the distance of the Earth from the Sun. It must therefore have experienced a heat 26,000 times greater than we ever receive from the Sun's rays and if to obtain a more elevated point of comparison it is compared to that of red hot iron it will be found that this comet must have been 2,000 times hotter. From this it appears that the comet must have been composed of very solid matter not to be dissipated by such an intense heat and this affords a new proof of the permanence of these bodies. Newton conjectured that this comet as well as others which like it revolve round our Sun approximate continually to this body at each revolution and that the[y] ultimate[ly] fall into it, for the purpose of supplying the loss to which it is continually subject by the emission of particles of light. But this is purely a matter of conjecture and must not be ranked with the astronomical discoveries of Newton, but which are not the less solidly established whatever may be the fate of these conjectures. ed. These appendages to cometary bodies present various appearances according to the positions in which they are perceived. If a comet is moving in a direction nearly at right angles to the path of our Earth it will appear to have a tail in the direction opposite to the Sun, but if the comet is moving almost directly towards us or directly from us it will appear to be surrounded with a nebulosity, and in particular cases is said to be bearded. After Newton no one contributed more to the improvements of this branch of Astronomy than Dr. Halley. This learned astronomer presented to the Royal Society in 1705 a treatise on Comets in which he applies the principles taught by Newton to the determination of the orbits of comets and he formed tables of their motions similar to those of the planets. Towards the conclusion however he gave other methods of his own on the more accurate supposition of their revolving in ellipses. This was the most valuable and interesting part of the curious communication of the author. He calculated the orbits of the comets and formed them into a table in order to compare them. By this means he had the satisfaction of verifying the opinion of those who supposed these stars [were] subject to periodical return. In fact from the inspection of the tables he found that the comets which appeared in 1531, 1607 and 1682 had very nearly the same orbit and the intervals between their appearances were nearly 75 years. From this he concluded with a very high degree of probability that it was one and the same comet whose period of revolution is about 75 years. He found that the inclination of all the three orbits was about 18 degrees and that, if the mean distance of the Earth be supposed to be 100, then the least distance of the comet of 1531 was 57, that of 1607 was 58 and that of 1682 was 58. This difference is very small when we consider the imperfection of practical astronomy at the time the observations on which these calculations were made depended. These were strong reasons for presuming on the identity of the three comets but further circumstances rendered it still more probable. In counting back from 1531 75 or 76 years we find other comets. Thus in the years 1546, 1380 and 1305 [also in 1230, 1155, 1080 and 1006] there appeared other comets. In fact no astronomer has transmitted to us observations by which we may determine decisively their orbits, but by comparing their appearance and motions as transmitted to us by historians with those of the comet we are considering and allowing for the different positions of the Earth Dr. Halley found they agreed very well. Thus assured of its revolution in 75 years he ventured to predict its return in the year 1758 or 59. This is the first prediction that was ever made of the appearance of a comet and it is well known that it was justified by the event. Dr. Halley remarked that the comet observed in 1661 by Helvetius and that of 1532 seen by Appianus were the same. Had this been the case it ought to have returned in 1780 or 81. This however was not the case. By comparing his tables of the orbits of comets Dr. Halley conjectured that the brilliant comet of 1680 had reappeared several time at the distance of 575 years. 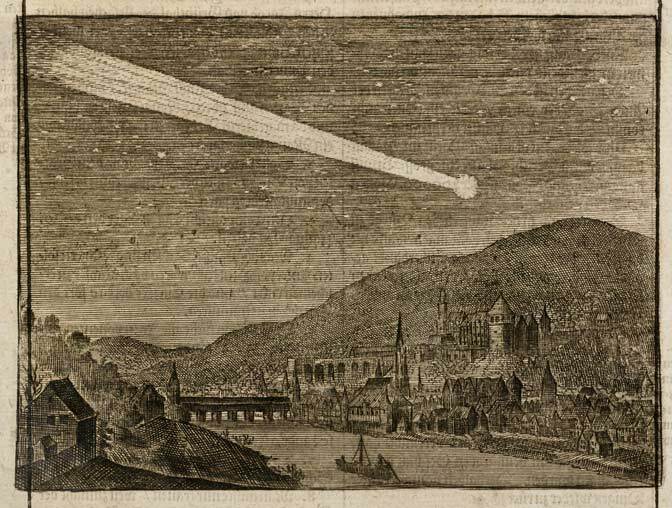 He founded this opinion on the following circumstances that in the year 1106 there occurred a beautiful comet whose description much resembled that of 1680. In the year 531 a similar one appeared, and in the year 46 before the Christian era appeared that prodigious comet so celebrated by historians and which followed so nearly the death of Julius Caesar. But Dr. Halley went still further in continuing to retrograde 575 years at each step: he found that this same comet must have appeared very nearly at the time of the universal deluge, and he formed the bold conjecture that this was the secondary cause made use of to produce that horrible catastrophe. This body was accompanied by a tail of prodigious extent which according to Newton consisted of vapours raised by the solar heat. Halley supposed that the Earth might have passed through this and that by the effect of gravity these vapours would have fallen on its surface and thus produce the immense body of water by which our globe was inundated. The celebrated Whiston has supported this explanation of the deluge with much ingenuity and seems by his zeal to have acquired the title of its author although it was undoubtedly Halley's. It may be observed that it is scarcely probable that such an effect would result from our globe passing through the tail of a comet. Vapours rarefied to such a degree as these must be even if they exceeded our globe many times in volume would form but an inconsiderable quantity of water insufficient for the ravages of which the traces still remain. It would be easy to prove this from considering what has been demonstrated by Newton that a cubic inch of air would if carried to the distance of the Earth's semidiameter from its surface be rarefied to such a degree as to fill the whole space from the Sun to the orbit of Saturn. This same comet has been employed by another celebrated writer to explain another point of history. He conjectured that this same comet appeared about the time of Ogyges and that it gave rise to the singular phenomenon which has been mentioned by historians with astonishment. They relate that 40 years before the deluge of Ogyges, the planet Venus was seen to quit its ordinary course and to be accompanied by a long train of light. Upon which the learned writer observes that in the infancy of Astronomy men might easily mistake a comet just disengaging itself from the sun's rays for the planet Venus quitting her usual course and accompanied by a long tail. But so many other comets might have given rise to this mistake that we can unfortunately determine nothing certain as to the date of this deluge from such a circumstance. Since the period of Dr. Halley much more extensive tables have been formed. It appears from them that there are nearly as many whose motion is retrograde as there as ones whose motion is direct, and it also appears that their orbits are inclined to the ecliptic at every possible angle. This is another and powerful argument if any further one were wanted against the theory of vortices. It may also be remarked that the greater number of comets descend towards the Sun within the Earth's orbit. Of the 35 whose orbits were calculated by La Caille there were only six whose least distance from the Sun exceeded the mean distance of the Earth from that body. The comets appear to have no fixed zodiac. On the contrary there is scarcely any constellation in the heavens in which some comet or other has not been seen. These different positions and the different inclinations of their orbits do not appear to be the effect of chance but rather affords cause for admiration. If they had moved in the plane of the Earth's orbit or very near to it everytime a comet descended towards the Sun or ascended from it we should be exposed to the danger of a contact, if unfortunately our globe should at that time be situated at the intersection. But by means of this inclination it happens that not one of the orbits of comets yet known cuts that of the Earth. It would indeed be a very curious spectacle to see a comet pass at the distance of one or two diameters from our globe. Possibly these might result [in] some physical changes in our little system which might not be disadvantageous to us. A celebrated naturalist has supposed we might acquire a new moon and has attributed a similar origin to the one we possess. It might however be more happy for us to be deprived of this advantage then to incur the risk of so near a neighbour. Of all the comets which have yet been observed that of 1680 can approach nearest to the Earth. Dr. Halley found from calculation that on the 11th November 1680 at one o'clock it was not further distant from the Earth's orbit than the Moon is from us. But there would have arisen to us no danger from this circumstance. It would only have afforded us an opportunity for curious observations if the Earth had been in a convenient part of her orbit. It is true we may not always be so fortunate. According to Whiston this comet [has] already been the instrument of divine vengeance [and] may at it return involve us in the burning vapour of its tail, and thus produce a universal conflagration. We must however always separate these bold and sometimes fanciful conjectures from the physical theory by which the motions of the bodies are calculated. In consequence of the predictions of Dr. Halley much more attention was paid to the discovery of comets. In the 120 years which elapsed between 1637 to 1757 on 20 had been seen, but in the next 50 years this number was more than tripled. It was observed that the comet whose return was predicted by Dr. Halley had alternately long and short periods and it was therefore supposed that it would return about the year 1759, and the astronomers of the time prepared very diligently to search for it. It was necessary to calculate the part of the heavens in which it would reappear but this and the precise time of its return were alike unknown, and this much increased the difficulty of the search. The astronomer Lalande was very ardent in the search and thus assigns his reasons for it. "It has already appeared" said he "6 times with very evident marks of identity particularly the last two or three times. There can therefore be no doubt of its return. Even though astronomers should not observe it they would nevertheless be convinced of it. It well known to the them that its little light and immense distance may possibly hide it from our view. But the public will hardly believe us and they will rank among the number of vague conjectures this discovery which does so much credit to modern astronomy. Disputes will again arise; the terrors of the ignorant will continue and 70 years must elapse before we again have an opportunity of removing these doubts." The astronomer Messier was actively employed during 18 months in searching for this comet. This labour was not, however, unrewarded for in consequence of it he discovered a new comet which he observed during several months. It was on the 21 June 1759 that he first had the good fortune of observing the object he was in search of. This day happened to be very severe and as soon as the stars became visible at sunset he profited by this circumstance and directed his telescope towards that part of the heavens in which it was expected to appear. After some time he recognised at about 7 in the evening a feeble light very similar to the small comet he had discovered in 1758. He had frequently imagined he had perceived this much wished for visitor, but he had been deceived by the numerous nebulae which are scattered in that part of the heavens. After a few observations he found from its motion that it was the object he was in search of. Dr. Halley had observed that the periods of the return of this comet were unequal. They varied from 75 to upwards of 76 years. He attributed this to the attraction of the planets. He knew that the motion of Saturn is very sensibly altered by the attraction of Jupiter and considering that the comet must pass near Jupiter he imagined this planet might cause the change in its periodical time. He was not however able to calculate this effect and offered it merely as a conjecture. A little before the reappearance of this comet Clairaut, who concurred in the opinion of Dr. Halley, undertook the calculation of the disturbance it must suffer from the action of Jupiter. This immense undertaking was however beyond the powers of one individual. Clairaut undertook the discovery of the plan to be pursued in these calculations and Lalande and Madame Lepante executed the calculations themselves. After 12 months of fatiguing calculations it was found that the action of Saturn was so considerable that it could not be neglected. The labour was therefore renewed. In November 1758 these immense calculations were completed and Clairaut was able to announce that the period of the comet which was just about to terminate would exceed the preceding one by 618 days. 500 were caused by the attraction of Jupiter and 100 were the result of the action of Saturn. He also announced that the comet would be at it nearest distance from the Sun on the 13 March 1759. It in fact only exceed the specified time by 22 days and arrived there on the 4th of April. Thus did the most celebrated of all the comets confirm the theory of Newton and afford a proof that they revolve round the Sun like planets. It must, however, be observed that this is the only one whose periodic time is well ascertained. The periods of the revolution of many other comets have been conjectured and their returns expected but with respect to them there is much uncertainty. The comet which appeared in 1264 and 1556 is expected in 1848. It may perhaps be the same as those recorded to have appeared in 975 and 395. But the observations of 1264 are too imperfect for us to depend much on its reappearance. The comet which appeared in 1770 occupied considerable attention. It was observed for along time, nor could any parabolical orbit be found which suited its motions. After immense calculations it was found by Lexell that it moved in an ellipse and that its period of revolution was 5 years. The terror which was excited by the comet of 1773 is one of the most singular circumstances in their history. It was occasioned by a paper of Lalande presented to l'Academie des Sciences, Paris. This memoir was not read at the time, but a report soon spread that Lalande had announced the termination of the world. It was supposed that it would take place in less than a year. As the report spread the time became shortened to a month and then it soon came to a week. The populace were alarmed and the police applied to Lalande to contradict the report. His explanation appeared in the gazette in a few days, but as this was not sufficient to justify him from the numerous absurdities which had been imputed to him he resolved to publish whole paper. It consists of an investigation into the probability of the contact of one of these bodies with the Earth. From a consideration of the orbits of all the comets which had at that time appeared he plainly showed the great improbability of such an occurrence. And since the more recent observation the improbability of the injuring [of] our globe is most materially increased. If a comet equal in magnitude to our Earth were situated at the distance of about 40,000 miles it would cause a tide of 12,000 [ft.] above the level of the sea, which would be quite sufficient to overflow in succession the whole globe, but, if we consider that the comet is in motion and the earth [is also] in motion, both very rapidly, it will be found that the effect of the comet, during the very short time it would be at the distance, will be wonderfully diminished, and, if to this it be added that as yet we have had no instance of any comet approaching to this magnitude, we shall find that the effect of a comet, even at this short distance, would be comparatively trivial. Of all the comets which have been observed that of 1770 approached nearest to the earth. Laplace found that by the attraction of the Earth its time of revolution was diminished two days, and that supposing it to have been of the same magnitude as our globe its reaction would have shortened the length of our sidereal year 2 hours 40 minutes. But according to the most accurate observations the length of the year was certainly not shortened 3 seconds by this comet, from which we may conclude that its mass was not equal to the ?th of our Earth. These bodies appear in general to exert very little action on the planets they approach. Their wandering courses do not disturb the harmony of the system and though frequently announced by the ignorant as the presages of misfortune they do not appear to have received the power of doing mischief. There has been much question as to the solidity and planetary nature of these bodies. It has been doubted whether they possess a real nucleus of solid material or whether their centre may not be the densest and most compact part of their nebulosity. According to observations on the comets of 1799 and 1807 by Schroeter and Dr. Herschel it appeared that they possessed solid nuclei of a round form distinct from the nebulosities which accompany them. This nucleus was not subject to the same variations as the vapours which surrounded them. It did not always occupy the centre but generally appeared to incline to wards the Sun. Dr. Herschel is of opinion that the body of the comet shines by its own light, for he observed that when from its situation with respect to the Sun we could not see the whole of its illuminated side, yet the light of the comet appeared by no means diminished but the whole surface shone with one uniform light much more resembling by its vivacity irradiance of the stars than the reflected light of planets and their satellites. This observation however would be satisfied by supposing the centre to consist of a dense mass of vapours through which the Sun's rays are refracted. In the comet of 1811 the central body was remarkably distinct from the surrounding vapour. In its appearance this was one of the most splendid which have been visible for many years. Its tail or the luminous train which it carried with it in one part of its orbit was 100 million of miles in length and about 15 million in breadth, yet notwithstanding this enormous atmosphere the solid nucleus of the comet was according to the observations of Dr. Herschel not more than 428 miles in diameter. This body would according to the observations made during it appearance describe an ellipse round the Sun in about 2620 years at the mean distance of 190 that of the Earth [is] from the Sun. This period might however be very much altered from the attraction of the planets and if at a very great distance it should be influenced but in a small degree by any unknown body it might suffer a total change in its orbit and perhaps never return to our system. Of the numerous comets which have been discovered during the last half century there is scarcely one which on whose certain return we can rely. Many have been found to move in curves called parabolas and hyperbolas, and it is impossible for those again to revisit our system unless some great change take place in their orbits. Laplace has calculated that supposing a comet to move in such an orbit it is 57 to against its being visible to our Earth. On the ground its seems probable that in the last 50 years between 2 and 3 thousand have approached the Sun though the larger part have been entirely unnoticed by us. It may probably be asked what becomes of those comets which retire from the power of our Sun and never return. Are these bodies lost in the immense deserts which separate our primary from the nearest of the fixed stars. It rather appears from mechanical principles that when a comet has by the action of any extraneous force acquired such a velocity as to cause it to quit the sphere of our Sun that it would pursue its unimpeded course until some other sun should exercise its influence on it and attract it towards a new centre. It might then descend with immense velocity towards this new primary and thus continue to visit system after system making as it were the tour of the universe. If this be really the arrangement of Nature there is doubtless some final cause from which these wanderings are directed. On this we can only form conjecture. It has been supposed that in the transit of these bodies through the immense regions which separate our system from the nearest fixed stars the comets pass through regions of nebulous matter which they convey to distant systems to supply the waste occasioned by the emission of light.